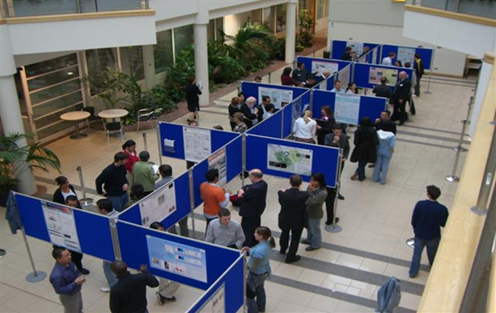 The Graduate School are holding their 9th Annual Poster Competition on Wednesday 7th May 2014 and would like to invite staff and students from the University to visit and support our research students. The event will be held in the Dialogue Cafe, ground floor of Rockingham Library, from 11am to 2pm. Open to all postgraduate research students, the poster competition gives students a chance to demonstrate both their written and oral communication skills. They are required to produce an eye-catching and well-written A1 poster, which illustrates and describes their research to a non-specialist audience. In addition to the poster they are judged on a 5 minute oral 1-1 presentation. Visitors are also encouraged to engage with the students, discussing their research with them. 23 posters will be displayed and judges will decide on a winner and two runners up, each earning a prize of £100 and £75 respectively. The prizes will be awarded at 1:45pm. The posters will remain on display in Rockingham Library until Monday 12th May, so do come along and see them when you can. Posted on April 29, 2014, in Events and tagged Graduate School, May 2014, Poster competition. Bookmark the permalink. Leave a comment.